Pouring caffeine-laced fuel on the Outer Banks espresso scene, Ashley’s Espresso Parlour has just opened its doors and java junkies should be rejoicing. It’s in Kill Devil Hills, on Helga Street, but so close to Kitty Hawk that probably some people won’t know which town they’re in … not that it will matter. What matters is what it feels like walking through the door, the service and the coffee. And Ashley’s Espresso Parlour gets it right on all counts. The Parlour is the creation of Ashley and Eric Linnekin. Some artists paint, some find their creative outlet in writing, for Ashley’s coffee beans are her palette. Her story began with a love of food. 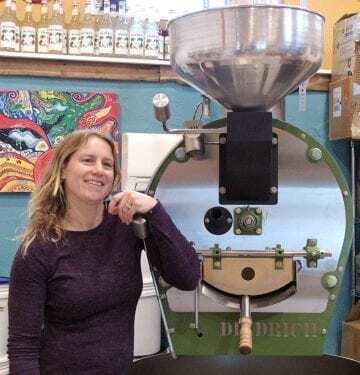 “I have a degree in culinary arts,” she said, and that degree led her to roasting coffee and exploring what can be done with a small tropical bean. “I’ve been roasting for about 20 years and fell in love with it,” she said. She describes roasting coffee the way a chef might preparing a fine meal. The result is coffee that is full-flavored with each single source, blend or roast being distinctive … and worth trying. It doesn’t matter how good the coffee is, though, if the feel of the cafe isn’t right. And as great as the coffee is, the ambiance of Ashley’s Espresso Parlour matches it. “I just want a place where people can come and just relax,” Ashley said. There is a very open, almost tropical feel to the shop, and that is by design. The couple are avid surfers and spent some time surfing in tropical waters. What they saw there influenced their design choices. There are a lot of little touches that go into the character of cafe. The artwork on the walls at the opening are by local artist Dawn Moraga, Red Dawn Designs, and the bright colors and tropical themes of many of her works match the feeling of Ashley’s Parlour perfectly. In its previous life, the building was a swimsuit shop and the transformation is remarkable. “People who have seen it before can’t believe what we’ve done with it,” Eric said. One of the most distinctive features is the coffee bar. A curved wooden form, it seems to flow into the main seating area. The woodwork, and much of the look, and feel comes from Eric. “I could visualize how this would work. Feel like how things would flow just looking at it. I guess I have a little bit of an artistic mind and this is my expression here. I did all the woodwork, all the trim work,” he said. Ashley’s vision of a place to just come and relax seems to have been realized. “He built my dream,” she said. This is a very family-friendly establishment. It’s open enough that kids can move around without bumping into tables; there’s a ukulele on the wall that anyone can try to play; and the bar is a great place to have a conversation with a friend. Ultimately, though, it is the coffee that determines how customers think of a coffee shop, and there are some touches that indicate true coffee lovers run the place. A regular cup of coffee is wonderful. The beans are always freshly roasted and that makes a huge difference. Their espresso drinks are a reminder of why the simple act of forcing steam through coffee grounds is loved the world over. Espresso is strong, but it should always be full-flavored and never bitter. Rather, it should be the concentrated essence of the bean that was used to make that particular cup of coffee. A very nice touch, Ashley puts an extra shot of espresso in lattes and cappuccinos. That truly elevates the combination of steamed milk and coffee. 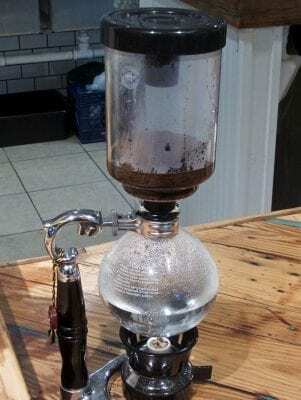 The Coffee Parlour is also the place to go to get siphon coffee. The process originated in Germany in the 1830s, and was popular for some time. It is now enjoying a resurgence. The process is reminiscent of a science experiment. There is coffee in the top chamber, water in the bottom chamber and a siphon in between. The bottom chamber is heated and as it is heated the water is forced up the siphon into the grounds. Heat is taken off the bottom chamber and as the it cools, gravity and air pressure cause the coffee to seep back into the bottom chamber through a filter. Science is wonderful, but the important point is that it makes a great cup of coffee. Ashley’s Coffee Parlour is open seven days a week 6 a.m. to 6 p.m.
“In the coffee business, I’ve learned, you if you close you break up somebody’s routine,” Eric explained.